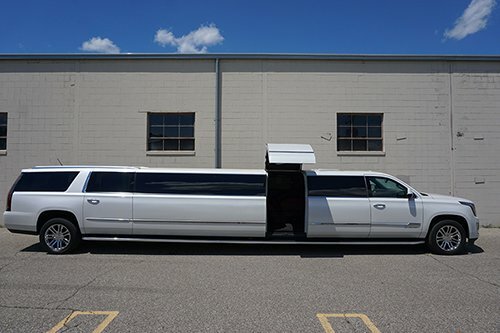 Our 20 passenger Escalade is one of the most popular in our fleet. 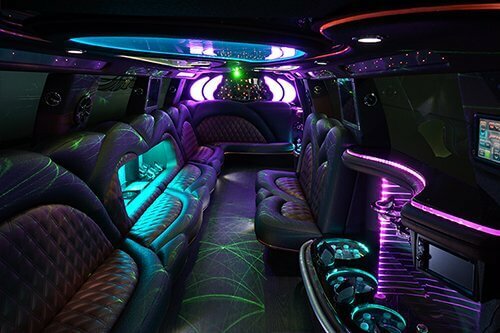 It has a white exterior and jet doors and a custom interior. There are color changing panels on the ceiling, on the walls, and also under the seats. The lights are controlled by a touch panel that has different options for how the lights change color. The bar tops are made from granite and have built in coolers and cup dispensers. There is also a garbage can for people to put their garbage to keep it out of the way. 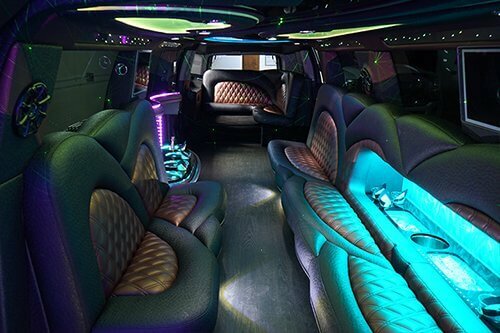 The seating is custom sewn leather and is on the perimeter of the vehicle so everyone faces each other. The bus has a very loud music system with subs that will play CDs or any MP3 player through an 3.5MM headphone jack.